UVA Hospital, and many other private and corporate collections. She lives in Roanoke, VA. 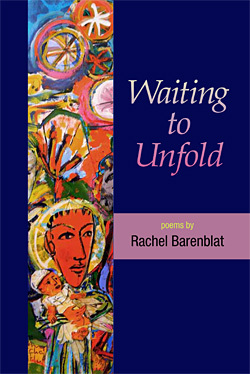 The image on the cover of Waiting to Unfold is a detail from her mixed-media collage, "Creation," 2013. Waiting to Unfold offers an unflinching and honest look at the challenges and blessings of early parenthood. Barenblat brings her rabbinic training and deep spirituality to bear on this quintessential human experience. She also resists sentimentality or rosy soft-focus. While some of these are poems of wonder, others were written in the trenches. These poems resist and refute the notion that anyone who doesn't savor every instant of exalted motherhood deserves stigma and shame. And they uncover the sweetness folded in with the bitter. By turns serious and funny, aching and transcendent, these poems take an unflinching look at one woman's experience of becoming a mother. These rich poems will carry you into the great timeless miracle and mystery of unfolding littleness, nonstop maternal alertness, beauty and exhaustion and amazing, exquisite tenderness, oh yes. Rachel Barenblat holds an MFA from the Bennington Writing Seminars. She is a Jewish Renewal rabbi, ordained by ALEPH: the Alliance for Jewish Renewal in January of 2011. She serves Congregation Beth Israel in North Adams, MA. She is author of 70 Faces: Torah Poems (Phoenicia Publishing, 2011) as well as four chapbooks of poetry: "the skies here" (Pecan Grove Press, 1995), "What Stays" (Bennington Writing Seminars Alumni Chapbook Series, 2002), "chaplainbook" (Laupe House Press, 2006) and "Through," a self-published chapbook of miscarriage poems (2009). Since 2003 she has blogged as The Velveteen Rabbi; in 2008, her blog was named one of the top 25 blogs on the internet by TIME. She is perhaps best known for "The Velveteen Rabbi's Haggadah for Pesach," which has been used in homes and synagogues worldwide. Her poems have appeared in a wide variety of magazines and anthologies, among them Phoebe, The Jewish Women's Literary Annual, The Texas Observer, and Confrontation. She lives in the Berkshire mountains of western Massachusetts with her husband Ethan Zuckerman, their son Drew, and their creamsicle cat. Find her online at velveteenrabbi.com.